100 million. That is the number of games sold in the Sims franchise in the last eight years. Try to let that number sink in as we contemplate how you possibly follow up two of the biggest PC games ever made in the third iteration of the smash franchise, The Sims 3. 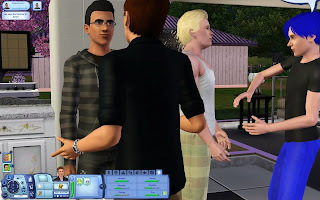 Prior to the release of the game, much was made of the new focus on interaction with your Sims rather than the meticulous micromanagement which characterized the first two games. Did this new direction for the series result in a more enjoyable experience overall, or did EA take a game already perceived as casual and turn it into a cakewalk for even novice gamers? The full review (thankfully not in Simlish) after the break. We like to assume a certain amount of videogame savvy on the part of our loyal NGP readers. Perhaps this assumption is at our own peril, but I'm willing to bet you've have had some exposure to the Sims franchise along the path of your gaming lives. It stands to reason that you have likewise established opinions about what a Sims game is, and what it offers. What I can tell you about the Sims 3 that remains true no matter what your previous experience is this: the same core gameplay that has been there since the first iteration remains, and if you're one of those cynical people who demands a franchise reinvent itself every time, then this game may not be for you. The Sims 3 does not seek to reinvent the wheel, it attempts to polish the chrome until it shines. By and large this has been accomplished. One of the issues from the previous games that EA has rectified in this version is the amount of micromanagement needed to carry out the day to day activities of the Sims. Tasks like showering and taking a Sim-dump took far too long, eating up precious time needed for maintaining the social relationships required for job advancement. Menial tasks have seen a reduction in time consumption, with all but a few of the chores feeling close to an appropriate amount of time spent in their undertaking. I did feel that the amount of sleeping they have to do (governed by the energy bar) was a little more than necessary, but that might be my own night-owl tendencies speaking. This can be countered by the purchasing of Lifetime Rewards, but we'll get to those later. The decision to reduce the amount of time needed for the less entertaining aspects of the game (cleaning, eating, etc) goes a long way in allowing the player to enjoy the new features The Sims 3 has to offer. So too has the amount of mandatory social interaction decreased, and it is no longer as closely tied to job advancement, removing the need to have your Sim constantly inviting over friends or chat on the phone. Now, you can choose to build relationships or ignore them, with less cost to your Sims happiness. There is still a social status bar to maintain, but it is far easier to keep it on the positive side. So you have all this new found time on your hands, but that would be useless without somewhere to spend it, right? Luckily, The Sims 3 has given the player lots to do both around the house and outside it. In your house, you'll have all the usual activities like watching TV or chatting on the computer. One of the best changes to the game as far as I'm concerned is the ability to place objects diagonally rather than the right angles you were limited to in previous games. It sounds like a small change, but it is something that Sims fans have been asking for since the first game, and it makes houses look far more like lived-in spaces rather than random rooms with various items in it. Where the game really starts to shine is when you venture out beyond your front door and into town. There have never been more destinations available to you, more places you'll want to check out rather than just firing up the chessboard for the 15th time. You can go grocery shopping, hit up a restaurant or bar, visit a park, attend classes that will raise your skill points and even discover new career options that you won't find by reading the newspaper. These destinations can be walked, biked or driven to, though you might enjoy setting out on your own and seeing what you stumbled across, since there is bound to be interesting gems, seeds or insects that your Sim can collect and catalog. There's limited "gaming" reason to do this stuff, but The Sims has always been marketed as a sandbox experience, and these collection items help in creating a world where exploration is encouraged. Sure, you can play the game just advancing up the career tree and get a nice house, but you'll miss a lot along the way if you do. What interests me about this is the game essentially becomes a reflection of your own life philosophy. Are you the type to put your head down and grind out the hours at work, or do you stop to smell the flowers? For the first time in the series, it feels like the game offers you a fun experience either way. Character creation is another key aspect of the series, and it has also been refined in this edition. You will have access to plenty of customization options to give your Sim the look you want, and the online community is fully supported, as custom creations are easier to import than ever before. In fact, the online community has been expanded to include both free and paid downloads (purchasable with "Sim Points"), the latest in a line of confusing currencies designed to make you forget how much you've actually spent on hairstyles and imaginary swag. I blame Microsoft for these, as MS points are deliberately hazy in their value, but that's a rant for another day. Thankfully, if you choose to ignore the online features, you'll still have plenty of options to make your Sim look their best. I managed to create some of my friends with a fairly reasonable amount of visual accuracy, and it didn't take ages to do so either. I can only imagine the stuff people who pour hours into character creation are going to come up with it. If someone wants to whip up a Jennifer Garner Sim, I certainly wouldn't complain. Some other points worth mentioning are the Lifetime Rewards, perks that will allow your Sims to sleep less, or go longer without eating without suffering hunger pangs. These rewards are unlocked by accomplishing tasks suited to your Sims personalities, so if you have one who demands cleanliness, something as easy as washing the dishes would give you points to spend as you please. This is where you'll feel like the game offers you some structure objectives, but again, it's entirely optional whether you want to pursue them or not. I feel like there's more we could get into, but part of the fun of Sims 3 is going to be in discovery, and I hope you'll give it a shot even if you've passed on the earlier games in the series. There's never been a better time to find out why the games are loved by so many, why not see for yourself?